It has been good to have some goals to follow for the month. I feel it has helped with my productivity, because I keep going back to look at the list and remembering things I wanted to do but hadn't got round to. Here's how I did. I have categorised into success, fail, and almost. I did not adapt it, but I had a good look at it and decided it didn't need any changes. I was kind of scuppered, anyway, because after years (literally) of badgering me about observations, now I have finally formulated my plan senior management have decided they don't want me to focus on that, they want me to look at coaching instead. I shall keep my peace about what I think of that. I did meet with them. We discussed other things. The wind was sort of taken out of my sails by the embargo on observations, so I didn't think the meeting was great, but oh well. I have finished teaching the English Civil War and the scheme of work is basically complete. I have really enjoyed it this time round, I think a combo of Ofsted and writing the SoW has made me really concentrate on progress, and I feel both classes have made loads. Hurrah! Yes, done. I am not as regular as I could be, but I have at least sent out some. No. I have worn a lot of different shoes and earmarked one pair to get rid of, but I haven't worn them all. Lack of car has made this impossible - by the time I walk to the leisure centre there'd be no need for me to do any more exercise. But I HAVE been to Zumba every week this month, except for the week I had governors and couldn't go. This was really tough, because I cleaned out my bookshelf fairly recently and got rid of two boxes of books. But I managed it! No. But I might try and do it this week. Done. This annual event always involves picking little felted balls of cat hair off the curtains whilst they are drying on the line. FUN. But done for another year now. Done and done! Blue jumper was finished in the first 10 days of the month, and then I finished the Versatility shrug/scarf thing, and I started and finished Hey Teach, and also picked up for one button band on the Central Park Hoody and finished it. I am pleased with my knitting achievements this month. Ohhhhh yes. Definitely. In spades. I had well over 300 printed by Photobox and I have albumed up a lot of them and planned how to display the rest. This was a really fun task! June goals coming up this week. 1. Sleeping with the windows open. Yesterday morning when I woke up I heard some huffing outside and when I went to look at what it was, it was a hot air balloon, right overhead. Not unusual around here but it still makes me cheerful seeing them - and I wouldn't have heard it with the windows shut. 2. Barbecues. Especially those kebabs my grumpy butcher does. Yum. 3. The point in the evening when it becomes cooler and I'm sitting indoors and get the cool breeze around my feet, like now. 4. My airy classroom, with all the windows open and the doors propped wide and the trees and shrubs in the thicket shading the windows: it's like some sort of colonial paradise (except on Thursdays, which is the day they cut the grass on the field; I know this because it is also duty day and I have had to do damage control on several pairs of shoes after tramping through damp grass cuttings in them). 5. Light knitting. Nothing big, heavy or hot. Like the shawl I want to start, or little sleeves, or cowls. 6. Light mornings. So much easier to get up early when it's been light for hours: I don't feel like I am missing out on any sleep at all. 8. Ice cream maker. I had been holding out on buying one of these until I could afford one of the mega posh ones with the built in freezing device but the freeze-the-bowl ones were on special in Robert Dyas at the weekend and I couldn't resist. Perfect for low-fat frozen treats. So far I have made lemon curd frozen yogurt, and toffee Malteser. Awesome. 9. Amazing plants. We have 2 courgettes, 4 tomatoes and a cucumber in the garden, plus some thyme and parsley coming up from seed. One of the tomatoes already has flowers on it! And the lilies we planted 4 years ago are really going for it this year. I may even feel confident enough to plant them out of their pot for next year. I can't wait for them to flower. Next stop: get rid of the shed and plant pumpkins and beetroot. 10. Mooing reverberatingly at random stuff like balloons. Mr Z added this one while I wasn't looking. I don't do this, but he does seem to enjoy it, when he's not playing his current favourite thing, Red Dead Redemption. He is slightly obsessed with his new horse. Something I do NOT like today is falling over in front of my neighbour because I was too busy looking in my bag for my keys and tripped over my own feet. Skinned knee a-go-go. I hate falling over in high heels because I feel like people are judging me..."Shouldn't wear the shoes if you can't walk in them!" I can, as long as I am not trying to locate something in my bag at the same time. Honest. I got up early today to shower before work and had enough time to pick up the collar on the Hey Teach, which is now done! So only the sleeves and buttons bands to go. And since the sleeves can be done on DPNs in the round, I have now freed up my 5mm tips for the Chinook shawl. 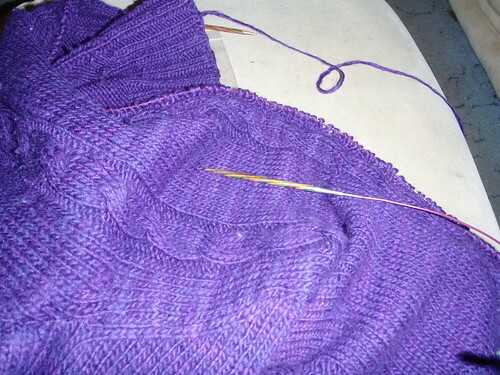 Dilemma: finish cardigan or start shawl? I found out one of my ex-students died yesterday. It's made somehow worse by the fact that it happened 10 minutes from where I grew up, in a car park I know very well, where we used to park when we went to the library, but which I wouldn't go near late at night. He would still have been in school, except he left last year at Easter to join the army. He came on the ski trip and it was the last thing he did before he left. He got compliments from all the reps for being so helpful and lovely. He was a PITA sometimes but his heart was definitely in the right place. One the last night of the trip, we let him and the other sixth formers stay up a bit later as a sort of leaving do for him, and I heard them come to bed and the girls went into the room he was sharing with two other year 12 boys. I gave them 5 minutes and then went and banged on the door. No answer. I tried again, and heard scuffling. He opened the door in his underwear, no lights on, pretending to be all sleepy, like the girls weren't there and I'd woken him up. I was not fooled - but it was a good effort and it made me chuckle. Still makes me chuckle. I am sad today :( it is sad, that he should have died so young. He hadn't even been in the army for a year. Mods: Well, some. Not really on purpose. I messed up the neck a bit by forgetting to decrease at the same time as increasing for the armholes (I think...it was a long time ago now) and that, combined with the added drape of the silk, made for a rather risque neckline. So I knitted the scarflet in a 1x1 rib and didn't double it over when I seamed it to the collar, giving a little more coverage. And I wore it with this brooch which is a little heavy but totally works. I had 2 compliments on it at work today but one was about my "cardigan". I guess it does look a little like a cardi. Next time I might knit it as such. I do intend to knit it again some time, this time out of something a little fluffier and lighter. The yarn dyed my hands and needles blue, and I gave it 3 rinses in blocking and the water was still running a little blue, but it was worth it for the awesome colour saturation. It is so soft and light, and actually very warm - I was chilly in it today and thought it was not as warm as I'd hoped, until I got home and took it off and realised just how brisk the air is (and it's May, fcol). It has a great drape, too. I was worried that if I knitted it to my actual size it would be too baggy and while it is loose, it doesn't feel unflatteringly so. I also finished my Versatility this weekend, only 6 months after I started it. I am embarrassed: it should have been such a quick knit but it just kept falling through the cracks in favour of other things with a less arduous mesh lace pattern. However, it isn't quite finished because I haven't sewn on the 16 shank buttons yet (le sigh) - but I am saving that dull task for knitting group on Saturday. So, as soon as I had both items washed and blocking I cast on for something new, heh heh! I have been waiting a month to get something finished so I can get on. I have started a new lacy top. It reminds me of sugared almonds. It is the second of my 10 lacy tops in 2010. I am not yet losing heart. Here are my May goals, I have added to the one from Comments list. I think it might be my favourite pic of us ever. I should maybe get some wedding pictures printed too, before our 4th year anniversary. So, Ofsted (the school inspectors) finally came in. They were around for Wednesday and Thursday this week, but I didn't see them, except when they introduced themselves on the first day, at briefing. I should be pleased but after all the effort I put into preparing, I am kind of disappointed. We passed. They have set teaching and learning as a priority; funny, I have deja vu - that was the priority last time. Perhaps some people at the top of the chain will pay attention, now. At least in September we'll have 3 new SLT members (if you count the deputy head who was new this year and hasn't been able to focus on her proper job due to the assistant head leaving at Christmas) so we might see some new and exciting things happening. Anyway, it rather ruined my week. I was off sick on Monday thanks to some bug I picked up at Wonderwool on Sunday, so I got the news at lunchtime but was stuck at home with no marking to do - and I was behind...so I left home by 6.30am on Tuesday, Wednesday and Thursday and left school 12 hours later each day. Joyful. And then on Thursday my Auntie Carol and Cousin Michelle, who I haven't seen for 14 years and 7 years respectively, were in Bath from NZ for one night only so we had dinner at Jamie Oliver's Italian, which was delicious (I had a salad with prosciutto and pears, yum), though I fear my conversation was a bit lacking. On the plus side, though, I have absolutely NOTHING to do this weekend, since I am now as up to date as it is possible to be, and the meeting I was supposed to present at on Tuesday is now filled with Ofsted debrief so I've been shunted to the next one. So this has been a truly joyful weekend off! That is 3 skeins of camel/silk blend and a skein of cashmere laceweight from Knitwitches (who got so sick of me hanging around dithering that the woman ended up yelling, "Oh for God's sake JUST BUY IT!" at me...great sale technique, though, because I did); a skein of alpaca/silk/cashmere laceweight from Artyarns (the pink one) and 100g of roving. Don't get excited, I'm not going to spin it - it's for thrums. It's got some silk in it so it's really tactile. I also bought an old Vogue Knitting from 2005; it's amazing how quickly things date. And I bought some awesome vintage buttons. They are really stunning - Victorian black glass, mostly, and some mother-of-pearl ones. I was tempted by a pair of riveted Victorian buckles but I couldn't think of a good use for them and they were very dear. I am still thinking of a way I could use them, in case they turn up at another fibre show in the future. I am in a laceweight place at present. I have a couple of laceweight jumper patterns high up my must-knit list, not to mention a burning desire to cast on something else from Victorian Lace Today. 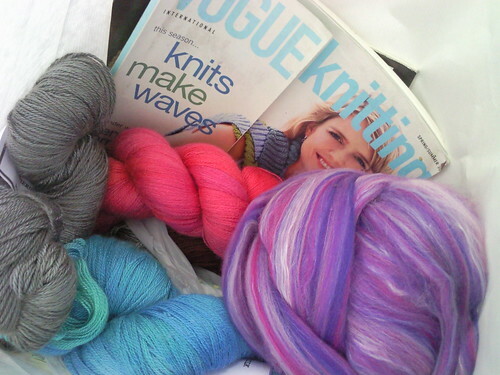 Also, laceweight can be stashed in sweater quantity without taking up too much space. 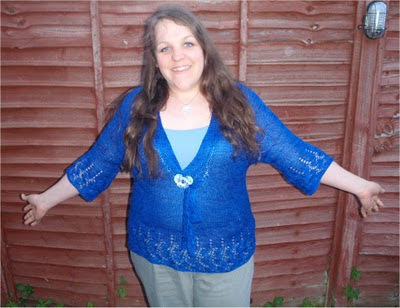 I do, however, need to finish the blue laceweight jumper of endlessness before I cast anything else on. I am very nearly done. I might even finish it tonight. We're having a barbecue tomorrow night, because it might not rain. I am baking a rhubarb cheesecake for the occasion. Rhubarb is another favourite thing about this time of year and I hope it works well with the cheesecake. Here is the recipe I adapted for it. Preheat oven to gas mark 4/180 degrees C and put the kettle on to boil. Mix the biscuits with the butter and press mix into base of a loose-bottomed tin. Chill until required. Beat the cream cheese until smooth and add sugar. Add eggs and egg yolks one at a a time. Pour in the sour cream, vanilla and liqueur and beat until smooth and creamy. Then stir in the rhubarb. Taste to see if it's sweet enough. Pour the cheesecake batter over the biscuit base and put in the oven with a roasting tin of boiling water on the shelf below. Place in the oven for one hour, until set on top and slightly wobbly underneath.